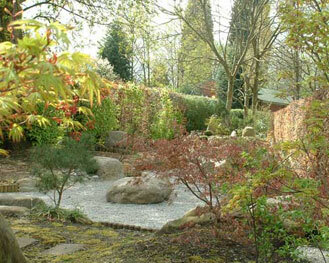 The Friends of the Walkden Gardens are grateful for the financial support given by Greening Greater Manchester for the completion of the Japanese Garden. It is a wonderful feature of the garden The garden is an attempt to create the feel of a garden as it might be seen in Japan, using design ideas commonly used in the Japanese garden tradition. As a garden that is walked through it is modelled on the ‘Stroll Garden’ style, whilst incorporating ideas from other styles too. 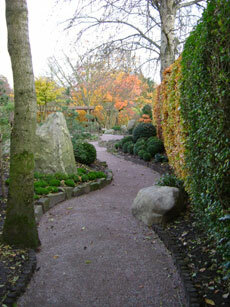 The path through the garden is deliberately winding, providing many different scenes as the visitor walks along it. 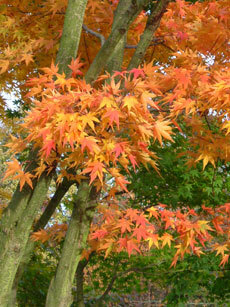 On walking back the other way, the garden looks different again, as other scenes become visible. 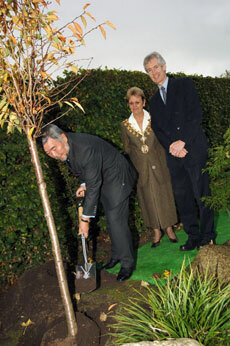 The garden is divided into three areas, each with distinctive characteristics. Archways and see-through bamboo screens separate these areas, giving the viewer the sense of passing from one space to the next by walking through the archways. 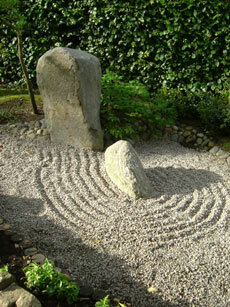 The first area is quite intimate, centred on the rock arrangement just beyond the main entrance gateway. On entering through the gateway, the viewer has little idea of what lies beyond this first garden. Only the path turning sharply away and the view of the first archway entice the viewer onwards. Within this entrance area the scene is of an undulating landscape, with the three large rocks representing Buddhist deities welcoming you into the space. The second area, beyond a bamboo-roofed archway, is much larger and is dominated by trees. It has the air of a woodland scene, based loosely on the ideas of a tea garden, where planting is more natural, representing a woody glade. 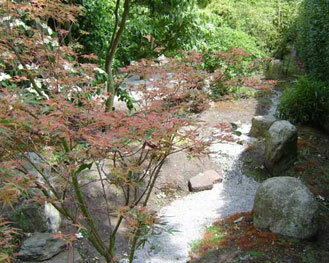 The gravel pool under a group of Acer palmatum trees could be imagined as mist lying in a hollow through which the trunks emerge, or as a pool of water left after a downpour before draining away. A side path leads to a more formally planted scene, with clipped rounded shrubs falling down a hillside topped by three more boulders, perhaps representing mountain tops. As the next archway is approached, a view of the third area is framed. 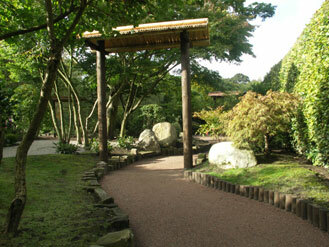 The third area is in the style of a karesansui, or dry landscape garden. 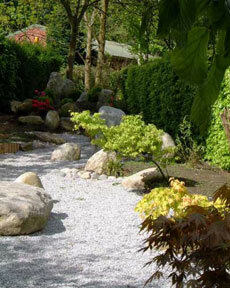 Here, gravel is used to represent a lake containing several rocks representing islands. Two of these suggest the form of a turtle, an important mythical figure in Japan, and one that symbolises longevity. Under a bridge flows a dry stream made with slate, and at the far end is a mound with rocks (mountain peaks), clipped shrubs (perhaps clouds round the peaks), and pruned pine trees suggesting a craggy mountain side. A second dry river emerges from the peaks and flows into the lake. The scene can be seen as the viewer walks alongside the lake, the view changing all the while, or from the covered seat, modelled on a tea garden waiting arbour, looking along the lake to the mountains beyond. On leaving the garden through the small gateway beyond the mountains, a look back through the archway shows a formal arrangement of clipped shrubs tumbling towards the viewer, acting as a visual counterpoint to the tall boulder on the other side of the path. The essence of a Japanese garden is the ability of the viewer to engage with the scenes presented, reminding them perhaps of real scenery previously observed. By connecting this way with that natural world the outcome is often a feeling of relaxation and calmness. 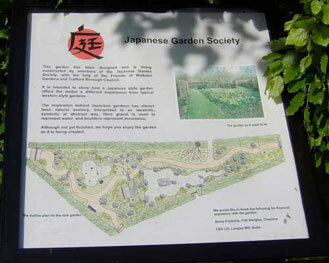 The Japanese Garden Society hopes to have provided a little of that essence in this garden.